Count on our proficiency when it comes to all sorts of cleaning tasks and make a booking for the finest cleaning services company in London. Hire Monster Cleaning Kingston and enjoy masterful cleaning assistance at affordable prices. With us you will be getting nice deals and discounted prices while receiving nothing short of elite purification assistance. Our experience in the field of office and household cleaning is immense. If you end up spilling something on your carpet you don’t want to wait for it to settle in. If stains go stale they are really tough to remove and this is why you should seek our help immediately. Monster Cleaning Kingston constantly has a team of cleaners available to show up on a short notice and take care of your sanitation needs. Dry carpet cleaning is available at the lowest prices with us. Get a single bedroom carpet cleaning for as low as 23£. If steam cleaning is required for your rug then the price will be calculated based on the size of the piece. Again the starting point is 23£. But if you are looking to steam clean your bathroom rug, it will be just 8£. 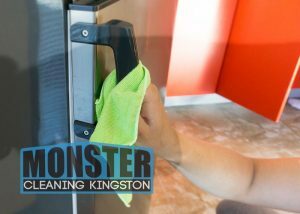 Monster Cleaning Kingston also has a few promotions for you to take advantage of. If you opt to get End of Tenancy Cleaning, you will receive 50% off carpet cleaning for the time being. Another package deal involving carpet purification is one-off cleaning where the collective price will be just 136£. For more information about deals visit our deals page. As far as end of tenancy cleaning goes, the prices are based on the number of rooms we are tending too. For a studio flat you will be paying 119£ and this is with carpet cleaning included! Our cleaners will make sure your place is squeaky clean and ready to be inhabited again. Even four bedroom flats won’t challenge us. For as little as 366£ for such a property you will be getting full end of lease cleaning with professional machinery and supplies. And you are guaranteed to get your deposit back! Your kitchen requires special attention and fortunately Monster Cleaning Kingston also specialises in oven cleaning. You can actually get that for free if you select our moving out deal. Other than that the prices start at only 14£ for a microwave sanitation. We’ll purify the filters, the grills, the window and will overall change and improve the way you prepare your food. 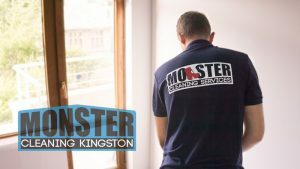 Monster Cleaning Kingston’s general domestic cleaning services are second to none in terms of quality. No corner in your house will be left behind. We have the right tools to clean corners and even hard to reach spots such as areas behind large pieces of furniture, fridges and ovens. No type of floor can be too hard to sanitise with our powerful vacuums and steam cleaners. We rely on excellent training, expertise and advanced equipment. Our technical capacity allows us to take on large scale cleaning projects regardless of nature. All of the above goes for office cleaning as well. A crucial factor here is our flexibility and the fact that we are always available for all businesses in Kingston. Window washing can also be made part of the deal in order for a reduced price to be obtained. Hire us at suitable for you time for an office cleaning and we will make sure not to disturb your work flow and business schedule. Learn More about us and how to get in touch with us.